Here is another painting I have just started to work on. I want to demonstrate that color variation can be used to highlight or separate different parts of the body. It is tempting to want to paint the figure using one color for the flesh and adjusting the value using tints and shades to create the forms. To me this is a mistake to rely on just the value relationships. For various reasons, our flesh expresses different colors in the skin at different locations on the body. Today, we will look at one of those reasons why the color may vary throughout the body and see how we can take advantage of that to help separate the forms. 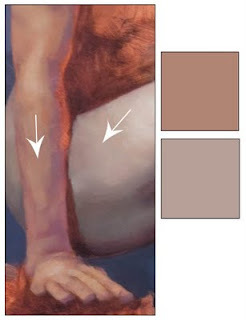 You may have noticed that in the painting above the colors of the arm are slightly warmer than the colors of the leg. Exposure to the sun is one possible reason for this. In general, our arms get much more exposure to the sunlight than the thigh of our leg. Using pinks and violets in the arm and cooler blues and violets in the leg can help illustrate this. I want the arm to be an area of focus in this painting and I look for ways to draw attention to it. The value levels of upper arm contrasts against the values of the shadow on the torso and, in doing so, draws the attention to that part of the arm. I could see that there was a slight variation in color between the arm and the leg and I decided to use that to help define and the visually separate the forearm from the leg. I could also use contrast in value to help draw attention to the forearm. There would be nothing wrong with doing that. However, the upper arm is already using that technique to separate the arm from the torso and I thought it would be better to use a color contrast to bring the arm out away from the thigh. In this next image you can see that I have two swatches of the colors used for each area. In this composition warmer colors are used to advance or bring forward form and cooler colors are used to push back forms within the space. 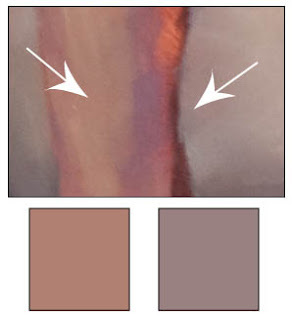 In the detail to the right I have two more color swatches showing the difference in color temperature between the forearm and thigh again. Hopefully, by zooming in on this area the color difference becomes more apparent. This technique is not only useful in painting the figure. In whatever subject you like to paint shifting the color of different areas of the subject will give you more control over how to guide the viewer through your composition.